Happy New Year!!! Hope you all had a wonderful evening doing whatever it was you wanted to do. We shared an early party with some friends and all 3 of us were sound asleep by 9:30! Winner! This whole holiday period has been an interesting experience with a life hungry toddler. Sleep and routine have shifted hugely, and our “no TV” house has turned into a daily dose of Play School on the laptop for some quiet time. Thankyou Big Ted! This year we hosted Christmas Day at our house with my mother in law and brother in law joining us for lunch. I wanted to cook something a bit tizzy but simple to make. 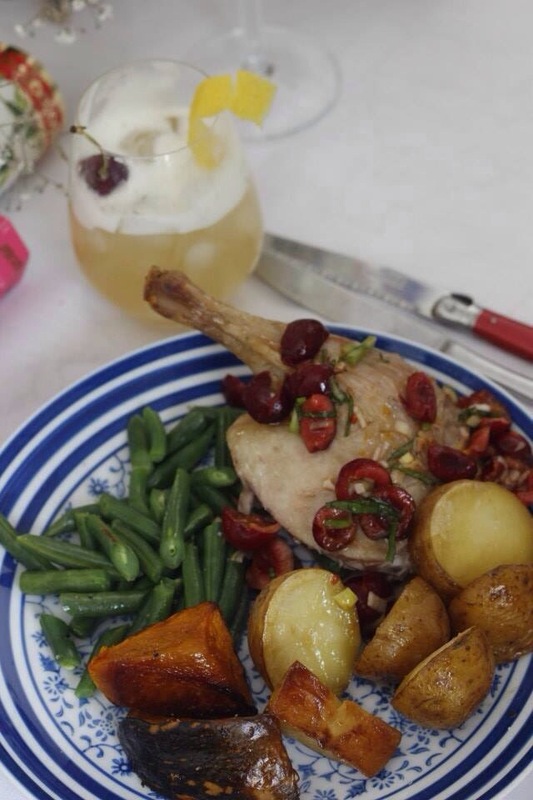 I found a 2kg duck for $14 at Coles a few weeks ago and thought it would be the perfect treat! Mmmmmmm roast duck. I grew up in a suburb that had multiple Chinese Roast Duck shops, so I had high expectations. The recipe I used was super simple and easy. Stuff the duck with fresh orange, cinnamon and thyme. Season well with salt and roast at 170 (fan forced) for 1.5 hours. Rest for 20 minutes and serve with a basil and cherry salsa. I added a few potatoes to the pan thinking potatoes roasted in duck fat, AHmazing. The duck was tasty, but we got in a bit of a flap trying to get everything on the table at the same time so was served close to cold. It was lovely and moist but the skin didn’t have that beautiful crispy, caramelised goodness I associate with roast duck. The salsa was delicious and would be one to keep in mind at summer time. The potatoes didn’t look like much, not much fat cooked off the duck. But the flavour was a lovely surprise. All the yummy citrus and spice flavours had soaked into the potatoes, yummmmmm. A couple of days later I thought I would pick over the remains to get as much meat as possible to make something with. Once again, a duck ain’t a chicken. With a roast chook there seems to be ample meat to find in hidden nooks and crevices. With this duck it seemed to have twice as many bones and more fat than I had imagined. I began prying tiny morsels of meat off the bones until I grabbed something that felt odd. It was it’s wind pipe!!!!! I nearly flung the carcass across the room. I didn’t care how little meat was left on that thing, I wasn’t touching it again! So my duck spring rolls were more carrot and cabbage than duck, but were delicious none the less… And here is the recipe. Boil the kettle and pour water over the noddles. Let soak for about 10 minutes, until soft. Drain and rinse. Set aside. In a hot skillet or fry pan, add some oil and fry the duck meat, shallots and garlic until starting to get crispy. Add vegetables. Stir for a couple of minutes. Add kecap manis, sugar and curry powder. Mix together. Take off heat and mix with the noddles. Spoon some mixture onto a spring roll wrapper and roll as per packet directions. I found i had to squeeze it in tight to make them nice compact spring rolls. Continue until you either run out of mix or wrappers. Deep fry in hot oil until golden. Serve with rice, salad and some sweet chilli sauce. This made about 12 GIANT spring rolls.